Earth, stone, timber and steel on the Central Coast, NSW. We paid a visit to Craig Scott’s house on the central coast. 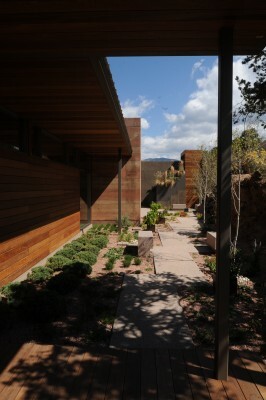 His place looks great with combination of the rammed earth, sandstone, rusted steel sheet cladding and thick hardwood beams. Even though his family is very artistic, he hasn’t needed to endure the dramas of colour charts. And If you are after some beautiful flowers contact Craig at East Coast wildflowers (no relation). “Increasingly, I’m more interested in what architecture does than just what it is.” This is how American Architect Larry Speck describes the newly built house in Santa Fe, USA (not built by us). ” In short, we’ve built a beautiful, self-regulating performance envelope with essentially just dirt.” See more pictures and information at his web site by following this link.